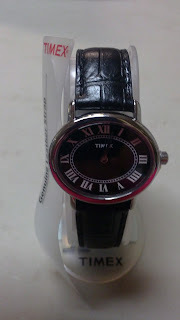 I received the T2M497 Ladies Watch from Timex, which features a black leather strap. This is an analog watch with Roman numerals, and stainless steel hands. I love the elegant simplicity of this piece. It is casual enough for my everyday wear, yet stylish enough to blend nicely with any dressier outfits. After a couple weeks of almost constant wear, I can also tell you that this watch is very durable! Racquetball, volleyball and kickball aren't contact sports, but in our family they usually end up that way-and this watch still looks as good as new! The wristband is very comfortable, and I love the leather. Leather bands seem to be going out of style even faster than wrist watches, but I still love the classic look! Check out Timex for all your timepiece needs; whether you're looking for sport, casual or dress for men or women, you can find what you want at Timex! "Timex Corporation is the nation's leading watch manufacturer. With a large and varied line of watches, Timex has the style for everyone. From the locker room to the board room, there is a great Timex style time-piece for you. Look for us at most mass-market outlets and many fine department stores. Of course, you can find our products on the wrist of many great athletes competing in Ironman® events world-wide." Disclaimer: I was not monetarily compensated in any way for this review. I did receive product for the purpose of review. All thoughts and opinions are mine; all quotes taken from the Timex website. This is a pretty watch. I have not got myself a watch in at least 10 years.. (I am long over due for a new watch) My eyes got bad and my watch was small so I just put it away and gave up. I see this one is pretty large, I like it! I have always loved Timex watches; they are very reliable. This style you have is a classic and lovely watch. Very pretty watch I have own Timex watches and have always loved them.